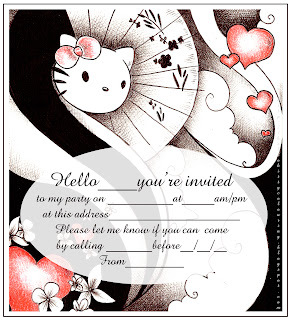 This is a very classy black, white and red hello Kitty party invitation. It is free, easy to print and would suit as an invitation to a teenage birthday party - or any other party - doesn't have to be a birthday - in fact the word birthday isn't on it. I think you 'll agree that it's a very classy and elegant teen invitation - it is also high quality so it will print nice and sharp and would look great if printed on card instead of just plain A4 paper - but either way it's very nice. Enjoy - just click on the image (and on any other image on this site) and it will open full size - then print it or save it to your PC.